At the European Bank's Reconstruction and Development Conference held in London in July 2008, Chief Marshal of Nigeria's F.R.S.C. Osita Chidoka said in his opening speech, "There are an estimated 161 deaths per 10,000 vehicles [due to traffic accidents] in Nigeria." Because of the bad state of the roads and negligence in repairing them, that number is not getting any better. With the amount of gaping potholes and abandoned debris, most state and federal roads are regarded as death traps. According to the F.I.A., "Every six seconds someone is killed or maimed on the world's roads." The majority of these deaths, about 70 percent, occurs in developing countries. 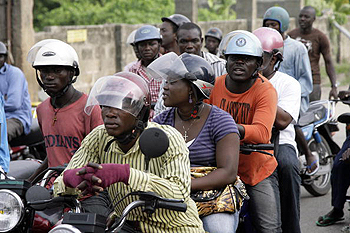 The road traffic injury mortality rate in Africa is 28.3 per 100,000 of the population. Nigeria is one of the worst cases. Not only are the roads in horrible condition, many times emergency medical services and traffic police do not arrive on the scene. In one of my regular visits to Nigeria, driving from the Ikeja area to Ibadan, I witnessed two ghastly road accidents within a few kilometers of each other on the Lagos-Ibadan expressway. I did not see a single traffic policeman or emergency worker attending to the victims, and yet I had counted eight police checkpoints between Lagos and Ibadan on the expressway that same day. I wondered if government officials traveled on these same roads, and what went through their minds as they did. Surely the resources devoted to these checkpoints could be directed towards road safety. In less than 15 months, Nigeria will be celebrating 50 years of independence, and it is time that the federal government develop a plan of action for road improvement and national safety in Nigeria. I propose a National Road Safety Action Plan to be implemented over the next 10 years. This would require the development of a comprehensive strategic plan that would involve coordination between departments far beyond federal agencies and policy makers, including everyone from insurance companies to driving schools. To begin, a Road Safety Improvement Committee would meet to devise a blueprint for advancing this net of safety efforts. The aim of these safety plans should be concentrated on the four "E"s: engineering, education, enforcement and emergency medical services. One of the committee's goals should be to establish and maintain a culture of road safety wherein responsibility is shared by many. While one department may be responsible for children's traffic education, another would be responsible for road crash problems and solutions, another for rehabilitation of accident victims, and so on. Everything from traffic law enforcement and sanctions to vehicle safety inspections should be covered, focusing not only on infrastructure but also on human factors, putting in place various forms of driver education. This same kind of road safety plan has been a great success in Malaysia (Road Safety of Malaysia, 2006-2010), Kenya (National Road Safety Plan, 2005-2010) and South Africa with its recent road projects. The United Kingdom has also launched an action plan to make roads safe that will take effect between 2010 and 2020. Road safety is a complex issue but is of concern to everyone. It calls for urgent action. A National Road Safety Action Plan would form the framework for better policy and use of resources. With regard to any expenditure on road safety improvement, the government of Nigeria should view it as an investment, not as a cost. Adewale T. Akande is an author and road traffic safety consultant in Alicante, Spain.